Road traffic accidents do happen, and the universe has no bias regarding whether you are driving your own car or a leased car. Don’t worry – if you have a lease car accident, there are plenty of people ready to help! Skip to the relevant section below, or continue reading for everything you need to know. How does insurance work on a leased car? What happens if you total a leased car? What happens if you return a leased car with damage? What happens if a leased car is stolen in the UK? Is it cheaper to insure a leased or financed car? When insuring a leased car, you are obliged to opt for fully comprehensive insurance – and this is good. Fully comprehensive insurance covers everyone involved in a crash, so both you and any other party will be looked after. Make sure you swap insurance details with anyone else involved in the accident – especially the person who was responsible for the collision. If that was you then it will be your insurers that deal with the situation, if you were not at fault then the at-fault insurer will be responsible for the costs of repair. Once you get home, contact your leased car finance company – it is important that you let the finance company know the car was in an accident. They will want to know the level of damage (for example, if the car is a total loss or ‘write off’), and they may have stipulations regarding where the car is repaired, which you must make sure are followed. If the collision was your fault but the damage is minor, you may want to pay for the repairs yourself to avoid losing any of your no-claims bonus. Make sure you follow the advice of your finance company regarding the authorised repairers, and get the work done privately. If the damage was more extensive, you will want to have the relevant insurance company take over the responsibility for you. You should contact your insurer and let them know all the details – if they are good, they will contact the at-fault insurer and often the finance company for you and deal with everything. It may be, however, that they need you to deal with any interactions with third parties yourself and will advise you if that is the case. If you are advised that your car is a total loss (also know as a ‘write off’ or ‘totalled’), then the finance company will work on the basis that you are purchasing the car and ending the contract. You will be provided with a final settlement figure that ends your contract with the finance company. The insurance company will also provide you with the fair market value of the vehicle to help cover this cost – often, however, there will be a shortfall. What is GAP insurance for a leased car? Ideally, you will have obtained GAP insurance when you first took out your lease. This insurance is designed to pay the difference between that offered by the insurance company and the amount that is owed to the finance company in the case of a total loss. We strongly advise anyone looking at a lease to consider GAP insurance to protect them in case they write off their lease car. For more information on the various types of GAP insurance and how it helps you, read our article GAP Insurance Explained. What happens when you return a leased car with damage? 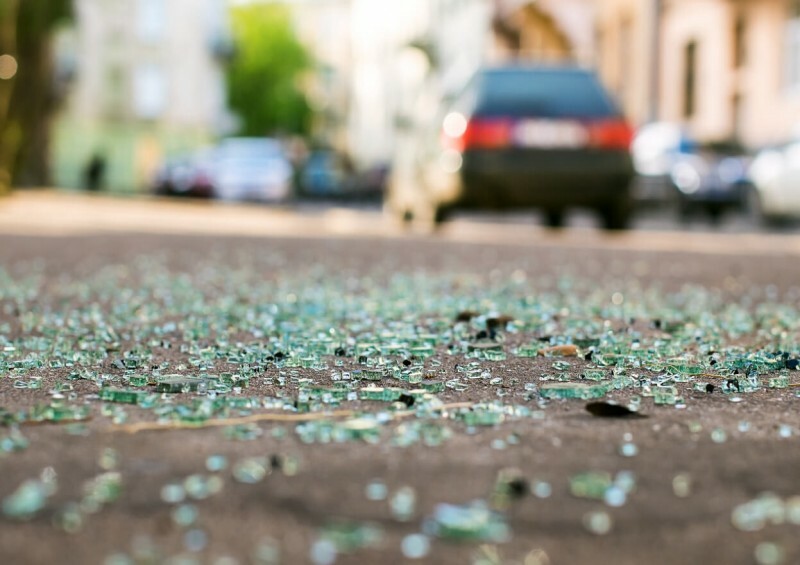 If someone hit your leased car but the damage was minor, you should still follow the insurance process through to make sure your lease car repairs are completed to the finance company’s standard. When you are in a car accident that was not your fault, you will not suffer any loss of a no-claims discount or other benefit from officially claiming the recompense that is due to you. If damage to a leased car remains when you finally return the car, you will be responsible for paying penalties on that vehicle, which are likely to be higher than the cost of repairs at the time of the accident. Returning a leased car after an accident is no different to a trouble-free lease, and you are expected to give back a vehicle in perfect working order, given some wear and tear. For more information regarding the penalties that can be applied, read our article on returning your leased car here. If the police are unable to recover your car, the finance company will need to settle up your contract as if you bought your car. This will result in a situation very similar to what happens if you total your financed car, described above. Just like if your lease car has been written off, you will be given the fair market value for the car from your insurance company and will be expected to cover any shortfall between that amount and the total remaining on finance yourself. Again, GAP insurance is really important here, as it ensures you are not left with a debt running into many thousands of pounds. When leasing a car, how does insurance work? Is it cheaper to insure a leased or financed car? Finance companies will insist on fully comprehensive car insurance before allowing you to drive away in a leased car. This means that not only will any third party be covered in the case of an accident, but your car is also insured in the event of a collision or other loss. The insurance company do not care whether the car is leased or owned outright – though they take a huge number of factors into consideration when determining your insurance premiums - the way you are financing the vehicle isn’t one. As mentioned above, however, the payout from a standard car insurance company in the case of a total loss can leave a significant shortfall due to depreciation and you may find yourself owing the finance company a much higher amount than the insurance company is offering. Guaranteed Asset Protection (GAP) insurance is specialist insurance designed to cover this difference between the current market value and the remaining loan amount (or even the cost of financing a replacement car). It should be considered near-essential with any lease. Everyone knows that car accidents happen, and they are an accepted part of a car lease - provided you follow the rules of your finance company, you should have no problem. Once the repairs on your leased car are all completed, you’ll be back on the road without any issue and it’ll all be behind you. It’s worth discussing with your finance company and insurance company about any clauses for courtesy cars or credit hire cars during the period your main car is off the road – they may be able to help make sure the whole incident is little more than a blip in your driving history. For any help regarding obtaining a car lease, GAP insurance or dealing with an accident in your leased car, give Complete Leasing a call today and we’ll be happy to assist!